F1 racing legend and Indy 500 champion, Emerson Fittipaldi, unveiled his dream track car, the much-anticipated Fittipaldi EF7 Vision Gran Turismo by Pininfarina, at the Geneva Motor Show today. The ultra-light, all carbon fiber supercar fuses the vision of F1 and Indy Car racing champion Fittipaldi, iconic Italian design company Pininfarina and race-bred German engineering firm HWA AG, and fulfills Fittipaldi's dream to produce a car with fierce track-racing capabilities, for drivers of all skill levels. "I have tried for years to explain to others what it truly feels like to be behind the steering wheel of a championship racecar. There is adrenaline and elation all rolled into an awe-inspiring inner fulfillment that leaves you craving for more. This is what our dream team created in the EF7 Vision Gran Turismo by Pininfarina," said Fittipaldi of the first car to be released under the Fittipaldi Motors marque. Revealing a commandingly sleek design underscored by an extraordinary power-to-weight ratio, the supercar's design theme - that of a shark, inspired by Emerson - finds astounding aerodynamic expression in the vehicle's flowing, aggressive lines; assertive yet incredibly beautiful and pure; and a balance between emotion and efficiency typical of Pininfarina's design work. "The EF7 is an exciting car that embodies Pininfarina's DNA in terms of style and innovation, Emerson's championship race experience and HWA AG's flawless engineering skills. Our collective team was able to turn a dream into a driving machine," enthused Pininfarina Chairman Paolo Pininfarina. The EF7's exceptional yet forgiving handling and performance, will be achieved through a powerful V8 naturally aspirated engine, integrated gearbox, suspension and braking system developed by HWA AG, and an with ultra-lightweight, all carbon fiber chassis construction with an exceptionally low center of gravity. Added Hans Werner Aufrecht, Founder and Chairman of the Supervisory Board of HWA AG: "In realizing the dream of a champion, the result is a car that combines racing technology and breathtaking design with drivability and the highest safety requirements." The carbon fiber monocoque is a specially designed safety capsule for both driver and passenger, enabling drivers to feel comfortable in the car, even while at its limits. "I have had the privilege to work with many great teams in my life on and off the track, but this project took me to new heights, co-creating with the masters of legendary car design and race-winning engineering," said Fittipaldi, who began his journey to create a supercar three years ago. "Combined they have over 140 years delivering on the elite cars of the world and this is now the same brilliance in the Fittipaldi EF7 Vision Gran Turismo by Pininfarina." The EF7 Vision Gran Turismo by Pininfarina will have a limited production with every EF7 owner having the opportunity to benefit from personal coaching by Emerson Fittipaldi himself and move up a driver-training ladder designed by the racing champion. In addition, owners will be able to join the Fittipaldi Racing Club which will provide exclusive VIP high-performance driving and racing experiences at some of the world's premier racing circuits, led by Fittipaldi and other racing professionals. Owners will also have bespoke customization options to personalize their EF7, complete with car interior and exterior options, multiple wheel options and personal Pantone color and racing numbers, along with Emerson Fittipaldi signature branding placement selections. Meanwhile, supercar fans and video game enthusiasts will have the opportunity to experience the EF7 in the virtual world where it will be exclusively available in the upcoming PlayStation4 videogame, Gran Turismo Sport. The highly anticipated title from Polyphony Digital Inc. will bring a new era to racing games through its accessible single player and online game modes, including the brand new FIA Gran Turismo Championships, created in partnership with the Fédération Internationale de l'Automobile. The FIA Gran Turismo Championships will create an exciting new platform for motorsports, and the virtual EF7 Vision Gran Turismo by Pininfarina will be a part of this, featuring exactly the same characteristics as the real track car. Kazunori Yamauchi, President of Polyphony Digital Inc. and creator of Gran Turismo, added: "The Fittipaldi EF7 Vision Gran Turismo by Pininfarina boasts a collective of some of the automotive world's best partners and it is a project we're honored to be a part of." Said Fittipaldi: "I won my first Formula 1 Championship at 25 years old, in a time when driving skill, team effort and technology played critical roles. In 2017, we are on a new horizon where real world and virtual world motorsports are merging and this is truly remarkable. Our partners, Gran Turismo, are the leaders in virtual racing field worldwide and we are truly excited to be working with them." What's certain is that in both the real and virtual worlds, the Fittipaldi EF7 Vision Gran Turismo by Pininfarina will provide an unparalleled racing experience for drivers of all skills levels. 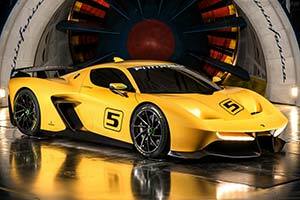 "Together we have built the Fittipaldi EF7 Vision Gran Turismo by Pininfarina enabling lady and gentlemen drivers around the world to truly experience a new level of racing euphoria and passion and push beyond their limits on the most prestigious race circuits worldwide," added Emerson. "It has been three years since I started this journey and today, 7th March 2017, thanking God for His kindness and grace on this journey of my life, I present to you the Fittipaldi EF7 Vision Turismo by Pininfarina."